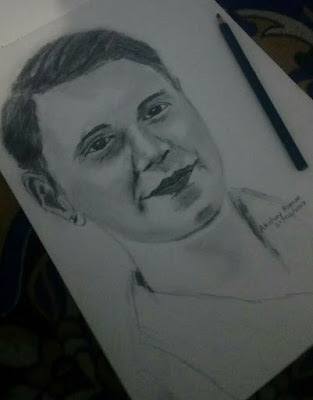 I drew this Pencil Sketch on the request of my colleague and friend Shri Lavenesh Kumar Sharma who is from Bhajanpura, New Delhi / AG office Mumbai about 8 months ago. It is made with HB and 6B pencils on a simple drawing paper. I had shared this sketch with him on facebook and whatsapp to know if he liked it or not. I will soon be sharing the Image where I am giving the original Sketch to Lavenesh Sharma. Wait for the next post where Akshay Kumar will be sharing more Drawing, Sketches and Arts of more people. Or you can request your own sketch.